Federal law mandates that emergency room staff must provide care for all patients, regardless of their insurance status or their ability to pay. However, this doesn’t mean that the care provided is free or even very affordable. Urgent care clinics can typically be more efficient and less costly healthcare alternatives to the ER. If you are facing a life-threatening health emergency, you should seek immediate medical attention at the nearest ER. More than ten percent of Americans remain without health insurance, despite efforts by the Affordable Care Act to provide universal coverage. When illness and injury strike, many uninsured people go without medical attention or go to their local emergency room for care. Using the emergency room for non-urgent situations puts tremendous strain on the ER staff and ends up costing the country billions of dollars in unnecessary medical costs every year. Going to the ER can also cost patients much more than alternatives, such as a visit to an urgent care clinic. It is not unusual for patients to wait hours in the ER before seeing a medical professional. In fact, the average time spent waiting in the ER is more than two hours. The average urgent care center visit can be under an hour. A study conducted by the Annals of Internal Medicine found that the average cost of an urgent care visit ranged from $71 to $155. Average emergency room visits can cost between $1,000 and $2,000. FastMed Urgent Care is committed to providing caring, high-quality, and affordable healthcare for non-life-threatening injuries and ailments. We welcome patients without insurance with a self-pay discount program, and we accept payments in the form of cash, debit cards, and all major credit cards. Offering service that istypically more efficient and less costly than going to the ER, FastMed Urgent Care medical professionals hope to serve you and get you back out on your way, and you don’t need an appointment. 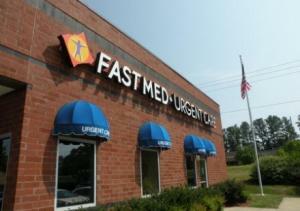 Contact us today to find a FastMed Urgent Care location near you!